The 2001 Grand Final put the wheels in motion for four years of Brisbane Lions dominance, where they reached consecutive grand finals. It was a warm day on September 29, 2001 when the Lions, in their maiden Grand Final since the 1996 merger, met the Essendon Bombers. “The excitement of the first one is something you’ll never match. It’s a childhood dream come true,” Lions veteran Jonathan Brown told LionsTV as part of their Premiership Pride series. The Bombers were aiming for back-to-back premierships that afternoon. While the Lions were on a roll, having not dropped one single game in four months. Former players say their run to the Grand Final started when they met Essendon in Round 10 at the Gabba. Until that fateful Saturday in Brisbane, the Bombers were deemed untouchable, having only dropped one game in 18 months. “I remember they were invincible. In Round 10 we got told about how invincible they’d been by Leigh,” Shaun Hart says. Brisbane roared to an unforeseen 28-point victory. “It’s what started our premiership run at Round 10 at the Gabba,” Hart says. Lions great Jonathan Brown says it was a movie plot that inspired the troops. “Leigh Matthews likened them to the Predator,” Brown says. “Schwarzenegger told his men ‘if it bleeds, we can kill it.’ And Leigh likened Essendon to the Predator and we had to see if they could bleed. All that stood in front of Brisbane and their first piece of silverware was the Bombers. “We knew that they were going to be the hardest opposition all year,” teammate Marcus Ashcroft says. Despite their incredible winning streak, Grand Final day was foreign territory as former Lions back Chris Scott explains. The Lions were down 20 points minutes before the halftime break but an important goal from Alaistair Lynch just before the siren kept them in the hunt. “We just knew we had to be within striking distance at half time because it was a hot day,” Brown says. Although they were trailing, the feeling in the Lions shed during the break was optimistic. “I remember walking in being a little unsure of where we were. But really quickly being comforted by everyone, not just the players, but the coaches as well. It felt like even though we were under pressure, we would eventually find a way,” Scott says. Ashcroft led the charge at the start of the third quarter, booting a goal from outside 50 metres that started their run. “There were many times in that third quarter that you know we just sailed away, there were one on one contests that needed to be won,” former Brisbane great Chris Johnson says. 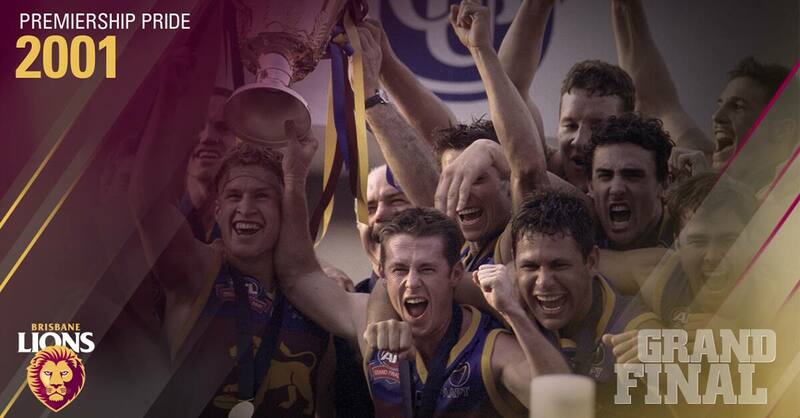 The Lions kicked six goals to one in the third term, which ultimately secured them the 2001 premiership. It was sweet reward for senior players in the group, who had battled through some tough seasons. Only three years earlier in 1998 Brisbane was awarded the wooden spoon. Many of the players in Brisbane first premiership side had experienced the low of the wooden spoon in 1998. Michael Voss, Justin Leppitsch, the Scott brothers, Clark Keating, Nigel Lappin, Hart and Ashcroft were in that team. “Under Leigh’s leadership we were able to unite and strong leadership helps teams stay the course. I think that’s what happened post 1998,” Hart says. For Brown, the narrative of 2017’s team is similar and he believes the potential that the 2001 team had is there to be unlocked. “I liken the group to the current group really. They started all as young men…They were the real core of younger players that got bashed around for the first few years but they grew resilience and they came through it together.